New York Condos project stands at the western gateway to Downtown Markham. Construction on the York Condos in Downtown Markham is well underway, but there were some unique challenges in its design. “This is very much a gateway building,” Sheldon Levitt, a principal at Quadrangle, the architect on the project, told Daily Commercial News in a recent article. “Enterprise Boulevard and Warden Avenue is the western gateway into Downtown Markham so we really wanted to have a signature work of architecture there. 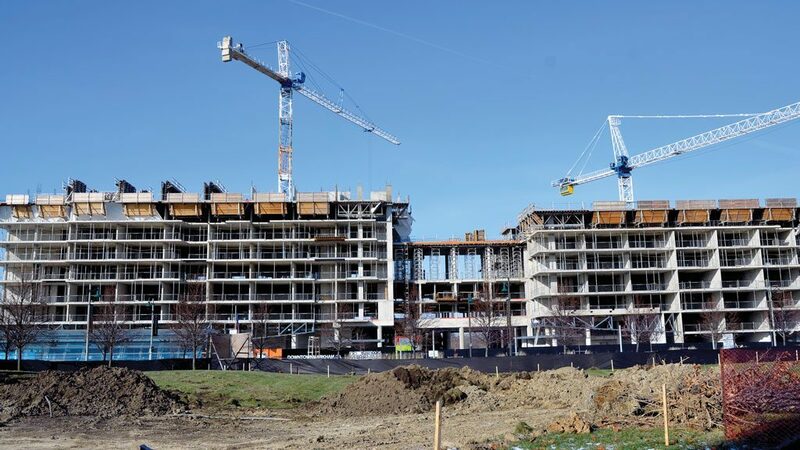 In addition to Quadrangle, The Remington Group’s latest condo project in their 243-acre mixed use development Downtown Markham also relies upon subtrades Jablonsky, Ast and Partners (structural), Able Engineering (mechanical and electrical) and Cosburn Giberson Consulting (landscape). The building, which is mostly residential with 545 units and a small 3,000-square-foot retail component, is expected to completed in 2019. Some of the challenges for the site, include its large, rectangular shape but also access. “It’s an interesting site, it’s a very challenging site,” Levitt told Daily Commercial News. The high water table in the area also created some challenges. The outdoor amenity space also features a pool. “It’s almost in a courtyard because the three buildings rise above that roof level but there is a large separation between the buildings onto the park so that courtyard also has views to the park to the north in the Rouge Valley,” said Levitt. Indoor amenity space connects the two larger buildings on Enterprise Boulevard and because there are a variety of units in the building, there are also a variety of amenity experiences, said Levitt. “There are some other amenity spaces located creatively around the building,” said Levitt. The design team wanted to give the building an urban feel.